THE MOST MESSED-UP MOMENTS FROM 14 YEARS OF SUPERHERO VIDEO GAMES - AWESOMELY NERDY NITPICKS! If you're a superhero fan who loves video games, you've experienced firsthand how pretty much every title out there - good or bad, remembered or forgotten - does something that's absolutely, unapologetically WRONG! with its source material. 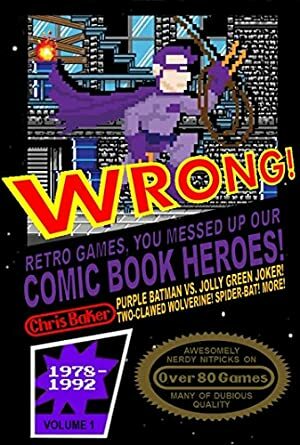 This ebook documents the most egregious - and most hilarious - offenders from the moment Superman flew onto the Atari 2600 in 1978 all the way through 1992, when Konami's classic X-Men sucked in quarter after quarter in arcades. • A Transformers game from the creator of Pitfall! • Who is "the Princess Peach of superhero games"? • Who was the first Marvel character to be featured in three games? And what's the single gaming appearance he's had since 1985? • Which super-character is most consistently misrepresented in games? • What common superhero gaming feature was pioneered by LJN's otherwise absolutely horrible X-Men NES game? • Which hero's primary gaming nemesis is someone he still has yet to even meet in the comics? • What do an NES game and a major restaurant chain agree is Wolverine's favorite food? • Why is Carnage getting naked on my SNES?! Atari 2600 | Intellivision | Commodore 64 | Nintendo Entertainment System | Game Boy | Super NES | Sega Master System | Genesis | Game Gear | Lynx | ZX Spectrum | MSX | PC-DOS | MORE! With years-long stints at Marvel and LucasArts (you know... home to Star Wars games), Chris Baker has played a role in the release of more than 40 game releases since 2005. To name a few: Marvel vs. Capcom 3, LEGO Marvel Super Heroes, Spider-Man: Shattered Dimensions, Marvel Pinball, Star Wars Battlefront II, LEGO Star Wars II... plus quite a few he'd rather not mention while trying to make himself sound awesome. He also worked in the games press from 1998-2005, most notably as an editor at Official U.S. PlayStation Magazine, where he wrote about hundreds of games. Log In to track Chris Baker on eReaderIQ. to be notified each time the price drops on any book by Chris Baker. to stop tracking Chris Baker. Log In to track Matthew Waite on eReaderIQ. to be notified each time the price drops on any book by Matthew Waite. to stop tracking Matthew Waite. We started tracking this book on July 9, 2015. The price of this book has changed 33 times in the past 1,383 days. The current price of this book is £1.99 last checked 14 hours ago. This book has been FREE 16 times since we started tracking it. The highest price to date was £3.21 last reached on May 7, 2017. This book has been £3.21 2 times since we started tracking it. We last verified the price of this book about 14 hours ago. At that time, the price was £1.99. This price is subject to change. The price displayed on the Amazon.co.uk website at the time of purchase is the price you will pay for this book. Please confirm the price before making any purchases.